You know that old saying about how watched pots never boil? That may be true in the kitchen, but your well-managed ETF portfolio still needs a watchful stir now and then if you want it to keep simmering along according to plan. That’s what rebalancing is for. Let’s say, for example, you start out with a carefully allocated 60/40 stock/bond mix, with tilts to some of your favorite equity factors for added zest. Even if you are the most disciplined, buy-and-hold investor in the world, some of those market factors will heat up faster than others over time until, eventually, your portfolio is out of balance. Through no fault of your own, you end up overweight in some of your holdings and underweight in others. Unless you happen to have some extra cash lying around to allocate into your existing portfolio (doesn’t everyone?? ), you typically rebalance by selling some of your overweight holdings and buying some of the underweight ones until you’re back on target – or close enough. Rebalancing may sound simple enough in principle. In practice, it takes a few button clicks before you’re through. Let’s walk through the process, using the Canadian Portfolio Manager Blog 60% equity/40% fixed income ETF portfolio to illustrate. You can read on, or click here to view the video version, whichever you prefer. To begin, hover over the DIY Investor’s Toolkit tab found at the top-right corner of the Canadian Portfolio Manager blog. From there, click on the Calculators tab in the drop-down. Once you’ve reached the Calculators page, scroll down to the Rebalance your Portfolio Calculator section and click on Download Calculator. We’ll get to the other columns on this page soon but, for now, you need only enter your target asset allocation in the Target (%) column, next to the relevant asset classes. For our example, our target asset mix is 40% Canadian Bonds, 20% Canadian equities, 20% U.S. equities, 15% international equities, and 5% emerging markets equities. Next, click on the Input tab at the bottom left of the spreadsheet. This is where you’ll enter your market values for each ETF. The first column of the worksheet labeled Security comes prefilled with the recommended ETFs from our model portfolios. Feel free to update these if you have slightly different holdings. Row 1 also lets you name the multiple accounts you’re investing in. In our example, we’ll keep it simple and assume your only account is an RRSP. Next, you’ll input each of your holdings’ market values into your account. To start, pull up the Balances section from Questrade and locate your account’s cash balance. In our example, that’s $1.90, so type $1.90 into the cash section of the rebalancing spreadsheet. Continue this process for each ETF in your RRSP by clicking on the Positions tab to view the market values of each one. In our example, you can see that we hold VCN, XEC, XEF, XUU and ZAG. Returning to the spreadsheet, simply type in the market value for each corresponding security. 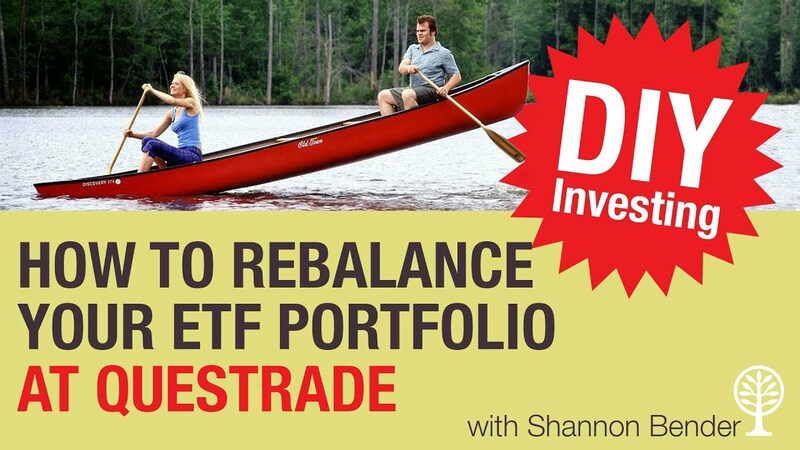 Once you’ve added the market values to your spreadsheet, the Rebalance Your Portfolio table will do the heavy lifting for you, suggesting which asset classes need to be rebalanced. Next, check out the Actual (%) column, which unsurprisingly displays your portfolio’s current asset allocation. Are the numbers there way out of balance, a little bit off, or right on target? In our illustration, we can see that we are under our minimum threshold of 35% for Canadian bonds. Additionally, we are over our maximum threshold of 25% for our Canadian equities. Our U.S., international and emerging market equities are all within their thresholds, so there is no reason to rebalance these holdings. So, in this example, we’ll sell some of our overweight Canadian equities and use the proceeds to buy more underweighted Canadian bonds. To achieve perfect balance, the Difference ($) column at far right suggests we’d need to sell $418 of Canadian equities and buy $395 of Canadian bonds. Since “close enough” is fine when rebalancing, we’ll instead sell $393 of Canadian equities to buy the bonds. At last … we’re ready to place our trades. First, we’ll sell those Canadian equities to generate the cash we need to buy more bonds. To begin, enter “VCN” in to the Order Entry field and click on the fund name when it appears. This will generate a quote directly below the stock ticker. When selling an ETF, focus on the Bid price, which is the price per share someone will pay us for our ETF. To calculate the number of shares to sell, use any convenient calculator, such as the one on your computer. Remember, we decided to sell $393 of equities, so we’ll divide $393 by VCN’s current bid price of $30.87. Rounded down to the nearest whole number, that’s 12 shares. Time to proceed. Enter 12 into the Quantity field. In the Order type, select Limit, to put a limit on how much you are willing to sell the ETF for. In the Limit price field, enter an amount two cents below the bid price – $30.85 in our example. Set the Duration to Day; your order will expire at the end of the trading day if it goes unfilled. Last but not least, make sure you’re trading in the correct account – the RRSP in this case. It’s easy to overlook that, and important that you don’t! Click on the red Sell button and an order confirmation box will appear. Once you’ve had a chance to review the details, click on the green Send Order button. Once your order has been filled, you’ll receive a confirmation at the bottom, right-hand corner of the screen. Close this notification and click on the Balances tab at the top left of the page. Your cash balance should now include the proceeds from the 12 shares of VCN you just sold. Once it does, you can place your second trade, to purchase ZAG. Click on the Positions tab and enter ZAG in the order entry search field and click on the fund name when it appears. To buy this ETF, go ahead and enter your full cash balance of $367.23 into your calculator, and divide it by the current ask price of $15.61. This equals about 23 shares. Enter 23 into the Quantity field, with a Limit price of $15.63 (two cents above the ask price). Click on the green Buy button. Review the details to ensure they reflect your desired trade (including doublechecking that you’ve got the right account) and, when you’re ready, click on Send Order. Your Questrade Positions page now shows that you have a 39.43% allocated to ZAG and 20.82% allocated to VCN in your RRSP account. Congratulations, you’re back in balance! Is Your High-Priced Advisor Any Wiser Than You? How Does Socially Responsible Investing Work? Creating Pension Income: Dividends or Balanced portfolios?